Globe Spotter: An artist's rendering of the 30-meter, $1 billion telescope that scientists want to build to better observe other planets. Despite what 'Rolling Stone' magazine says, the folks at UCSC are doing more than toking hooners in the redwoods. Meet Steven Vogt, UCSC professor and leader in the race to find other worlds. If you go straight long enough, you end up where you were. In most professions (besides porta-potty cleaning), an accurately calibrated fun-o-meter will detect a wide range of fun-ness. Rock stars get fame, fortune and outdoor wet bars with built-in shark tanks, but they also have to cry about MP3 downloading. Some planet-hunting scientists get to host press conferences announcing the discovery of the first Neptune-sized extra-solar rocky planets, but what about all those attacks from across the Atlantic saying that they found it first? Not fun. Just a few months ago, a team of American scientists--two of them UCSC grads and one a UCSC professor--discovered the first Neptune-sized planets outside of our solar system. Then, two months later, things got testy when a Swiss team of scientists held a press conference claiming that they discovered the first Neptune-sized planet outside of our solar system. But why all the fuss? Scientists have been cranking out new planet discoveries since 1995, when UCSC graduate (and current UC-Berkeley professor) Geoffrey Marcy and his team first worked out a way to "see" planets through a state-of-the-art spectrometer, designed by UCSC astronomy and astrophysics professor Steven Vogt. But the only planets that had been discovered until recently were gaseous, Jupiter-sized behemoths that could never support life as we know it. As important as those other planetary discoveries were, the so-called holy grail for our intrepid planet hunters is a planet with water in its liquid state. Without doubt, we can safely assert that the "Are we alone?" question is one that's tickled the astronomic imagination for centuries. "Certainly," says Vogt, looking comfortable in a pair of khakis and denim button-down shirt, "since Giordano Bruno was burned at the stake in the early 1600s for professing that multitudes of worlds existed, and that there were beings on those worlds, and that the universe was filled with that." The strange thing is that a uni-verse of possibility can be reduced to a single binary conclusion. "The question is, Are we alone in the universe?" says Vogt. "And it's a very profound question, because it has an answer. And the answer is either yes or no. It's not 'Well, I don't know' or 'Maybe' or 'Who knows?' or 'That's the wrong question.' No, it's a question that has an answer, and it's either yes or no. And either way, the answer is really profound. Either you're totally, utterly alone in this incredible universe, or you're not." Sitting together in his office in the Interdisciplinary Sciences Building on the UC campus in Santa Cruz, Calif., on the planet Earth in the Milky Way galaxy floating somewhere in the universe, at least Vogt and I have each other. But if we ever want to expand our horizons with extraterrestrial friends, we've got to find planets with water. Vogt, who teaches a course which attempts to squeeze an "Overview of the Universe" into 10 weeks--a process he describes as a bit like drinking water from a firehose--says this is the sine qua non of the E.T. issue. "If you want to find life of the kind that we understand--not life like, you know, a rock can be alive if you define it right, or gas can be alive, or does a star have a life? Well, who knows, maybe it does, but the kind of life that we know of--something that you can make a hamburger of, or vice versa--for that kind of life--you need water. And you need water in liquid form." If you were God, thirsty and without your dousing rod, here's how you might find water: Go find a star, get close enough that it thaws your toes, but not too close that it singes your eyelashes (yeah, yeah, we know it's still almost absolute zero out there, but we let you be God, so humor us). Look for a planet orbiting within this narrow range, because water is just going to be gas or ice anywhere else. Keep in mind that most solar systems won't have a planet in the so-called "habitable zone," because the "Killer Jupiters" already ate them. Seriously. See, most of the solar systems that scientists have found so far have giant planets the size of Jupiter--about 320 times the size of Earth--traveling in tight, elliptical orbits around the star. "You can convince yourself through numerical simulation that if you put an Earth in one of those systems," explains Vogt, "it would be tossed out of the system by the gravitational influence of the Jupiter, or it would be thrown into the star, or it would be eaten by [the] Jupiter itself ... So we want to look for systems that have Jupiters with big, circular orbits--systems that have basically safe parking spaces for Earths in the intermediate zone--and we've found almost none." Why not, intrepid planet hunter? Is it because of the red tape involved in securing time--sometimes as little as 10 days in a year--at a gigantically expensive telescope like the Keck observatory in Hawaii? Or is it more of a technical matter? Since planets don't give off any of their own light like stars do, finding them is unbelievably difficult. Even the incredibly powerful Hubble space telescope can't see them. The only way to "see" a planet is to infer its presence by its gravitational effect on the star around which it orbits. For example, if Annette Funicello's hips were a star, and the hula hoop spinning around them were a planet, all you would need to determine the hula hoop's mass is a powerful computer running a complex statistical modeling program on the distance between you and Funicello's hips. "It's similar to sitting up in your apartment looking out over central square," offers Vogt. "The people that are getting tugged the hardest with their leashes are the ones with the most massive dogs." But even measuring this barycentric "wobble" of a star is a whole different challenge, because the variations you're measuring, via Doppler shifts in the starlight, are about one-thousandth of one-thousandth of an inch. Using a state-of-the-art spectrograph designed by Vogt and built by a team of mechanical, electrical, instrument and software engineers, master opticians and computer programmers in the Lick labs on campus, Marcy and his team pioneered a way to detect tiny Doppler shifts in starlight. Their solution was to calibrate it through an absorption cell, a finely polished bottle of glass containing iodine gas. "So the light from a star is tickling the iodine atoms in this bottle," explains Vogt, "and how the starlight tickles this iodine in this bottle--which is not moving, it's bolted to your spectrometer--that provides basically the lines on the ruler." But hurdles remain in the planet hunters' quest for the grail. First of all, despite advances, data-gathering equipment would still have to be 10 times as sensitive as it is now to detect a planet the size of Earth. Second, planet-hunters are looking for solar systems where the detectable planet has a large orbit like Jupiter, which takes approximately 12 years to travel around the sun. So what might look like random fluctuations in a star's light might begin to make more sense if scientists could watch it for two years, or six years, or 12, or even more still. All of which means they need more time on the telescopes, and even more money to build them bigger and better. "If we could stop the war in Iraq for one day, we'd have our telescope," says Vogt, referring to plans to build a $1 billion, 30-meter telescope that would allow scientists to observe nearby stars, which appear dimmer. 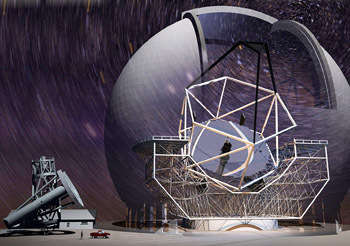 It would be the largest telescope in the world, with a dome protecting it that would be the size of a baseball diamond. The Lick team is working to get the project in order in tandem with the Associated Universities for Research in Astronomy (AURA), the Association of Canadian Universities for Research in Astronomy (ACURA) and the California Extremely Large Telescope Corporation (CELT). In the meantime, though, our fearless planet-hunting team will settle for a 2.4-meter telescope devoted entirely to collecting data about wobbling stars, which is scheduled to be completed next year up at Lick Observatory, thanks to some unintentional help from the Pentagon. "It was part of the Defense Department budget when George Bush declared war on Iraq," says Vogt. "The budget went right in under the radar screen and the military got anything it wanted. Well, we were in there between the tanks; we went right through with all the Bradley fighting vehicles. So the Defense Department is funding us for 6 million dollars and NASA has given us another couple million to build a totally robotic telescope that observes 365 nights a year and does nothing but look for planets." All this bodes well for the future of U.S. astronomical prestige. But for any planet hunters worth their Ph.D., competition is healthy and controversy is trivial. Vogt says that the important thing is not that the Americans discovered Neptune-size planets before the Europeans, but simply that three new Neptune-size planets have been discovered. "This event marks a very important milestone in the push towards ever-lower-mass planets," says Vogt, "eventually allowing us to find planets like Earth out there around the nearby stars." But if you still want to know who was first and who will be left behind (to clean out the porta-potties), then keep in mind that the Europeans went straight to the press with their findings, rather than pursuing the time-honored process of publicizing one's findings in a scientific journal. The American teams, on the other hand, waited to announce their findings until after their research had been accepted for publication by the Astrophysics Journal. All this, and a reputation for lazy hippies getting high in the woods, too. "That's what most people don't understand," says Vogt, who's worked at UCSC for the past 27 years. "Most people downtown think we're a bunch of freaks up here freaking out in the redwoods with the banana slugs, and, you know, there may be some of that, I guess. But we have a lot of really good students that go on to do really great things. And we have really top-notch faculty in a lot of fields, particularly astronomy; we're kind of the jewel in the crown. All of the UC system uses the Lick and Keck telescopes, so there's a lot of happening stuff here. We're different, yet we do very excellent work, state of the art stuff as good as anything the military does." Them might be fightin' words, but along with his proud posturing, Vogt seems to be having his share of fun on the whole planet-hunting adventure, which of course is what it's all about. "It's been an absolutely wild ride," says Vogt. "We've found things that we'd never imagined, and just sort of rewritten the textbooks every year, too. That's fun, when you're doing that. That's real progress in science."